I chose this interesting title inspired by a Chinese book written by Song Chi and bearing the same title.This book was a book of Forensics meant to aid in rectification of injustice in law and investigations.I felt that this topic justified the challenge that me and my husband took .You might have heard about the "Ice -bucket Challenge"seeking to give exposure and support to social causes .We took the Ariel #WashBucketChallenge because it seeks to challenge a social gender related stereotype that washing clothes is only the woman's job .More than me , it was my dear hubby who was happy to take on the challenge. Sweet as it may sound , but my Husband washed his own clothes long before our marriage because he did not want to burden his mother and later he did his own washing because due to his job he stayed away from home .Once we got married ,I took over the role of the homemaker and did all the chores myself .It was easy initially,as I had my washing machine to help me out .But things changed when I had a baby .There would be twenty baby pants to wash every day ,baby blankets , bed sheets in addition to our regular wash load .I became a bundle of nerves ,sleep deprivation ,breast feeding and a full time job .Suddenly the pile of clothes started looking like a daunting mountain to be scaled . Though Hubby dear took over on days when I was unwell or when I was away but the poor chap had such a hard time getting acquainted with my best friend-the Washing machine and then how to separate the whites, the colored clothes and the delicate ones and the various settings of the machine bewildered him to the the extent that he chose to do the washing by hand .Washing single set of clothes by hand is different and washing a whole household's soiled clothes by hand is almost a Herculean task .So I started asking him to desist from doing the laundery though secretly a part of me wanted to get rid of this daily , back-breaking chore. 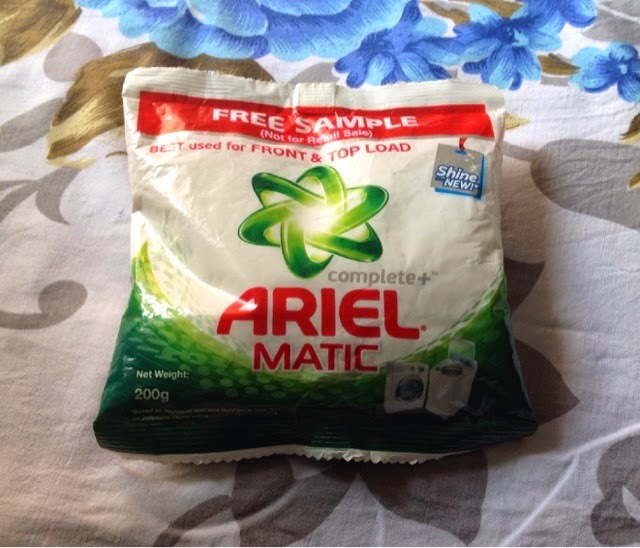 One day as we sat watching television, the Ariel advertisement came on the screen and that set the conversation rolling between us .Arun jokingly said that he too wanted to take the challenge as this was a good chance to finally bridge the gap between him and our washing machine .Though he had joked about it but he quickly added that he was really contemplating the challenge and wanted me to guide him. 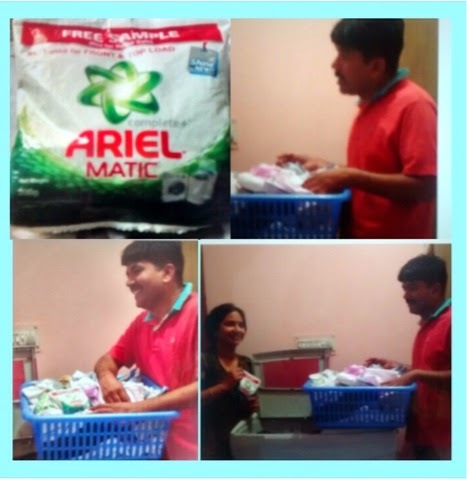 The next day ,I carefully instructed him about the water level,the wash load ,where to put the detergent etc.He listened like a rapt student .It was much easier this time as we were using Ariel Matic ,which takes care of delicate as well as heavily soiled clothes with equal ease .Fingers crossed behind my back I left him at it and he kept an eye on the machine while I used that time to get some chores finished in the kitchen . The buzzer finally went off announcing to the world that the laundering had been completed and that Hubby dear had passed his test with flying colours! 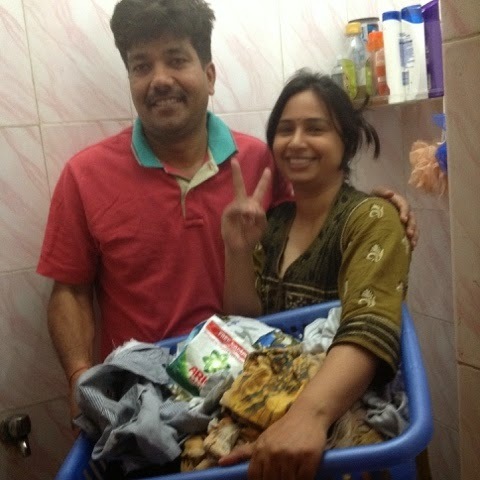 My man took the challenge and won .Are you man enough to shoulder the burden ? 'This post is a part of the #WashBucketChallenge activity at BlogAdda.com in association with Ariel India' .